There is an eternal battle in my mind when it comes to overripe bananas. “Milkshakes or Banana bread?” is the question. 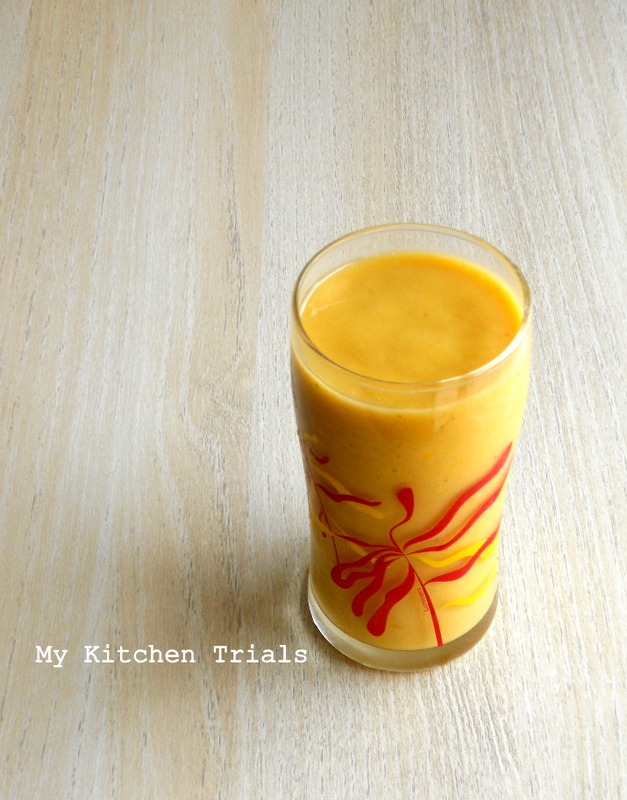 Milkshake is easy to make, it has no fat and not much of sugar either. But if you have ever eaten a piece of banana bread, you will understand why I prefer it over any number of milkshakes. Well, its yum, moist, sweet and soo good! So I usually buckle under the pressure and make a banana bread. Healthier the milkshake may be, but there aren’t any takers for it at my place. But jazz it up with a bit of this and that, the glass becomes empty before you even count up to 5. 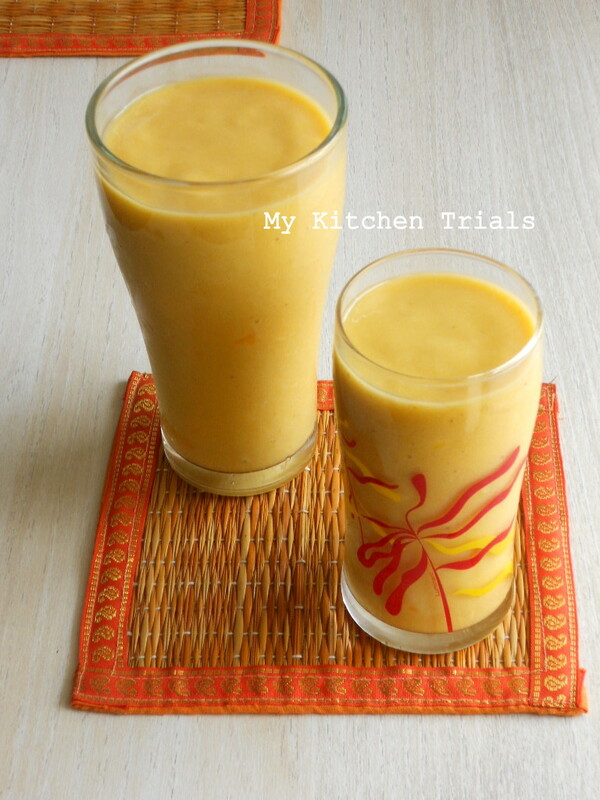 Strawberries, mangoes, apples are all great additions to the regular banana shake. 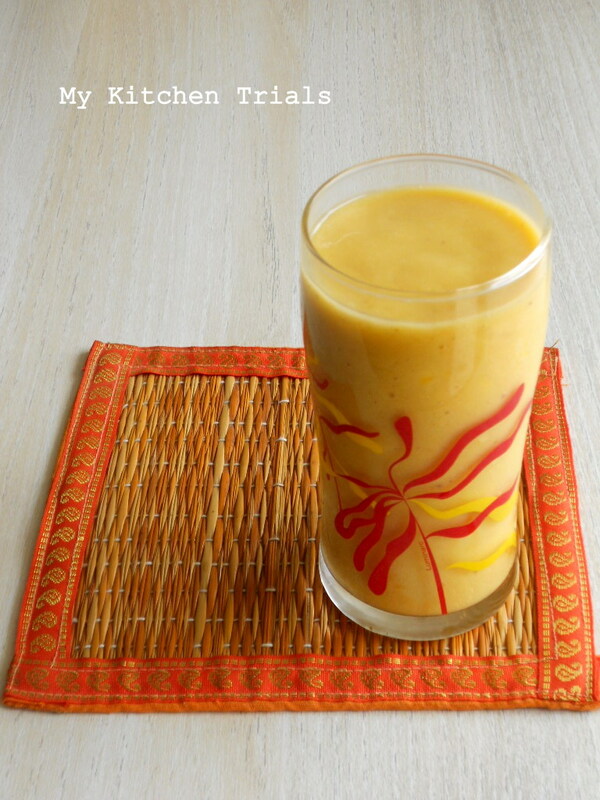 Today’s shake is a mix of mangoes blended with bananas and served in a tall beautiful glass. Peel and dice the mango and banana. I like it thick, so I don’t add too much of milk. You can adjust this according to the consistency you prefer. Blend in a mixie jar or blender with milk and sugar. Done! Serve chilled. Makes two big glasses. The recipe is linked to Blogging Marathon 31. Check all about it here in the Blogging Marathon page. This post is also off to Valli’s Kids’ Delight, hosted by Chef Mireille this month and Valli’s Summer Mela. Then you must parcel that banana bread to me ok..I would love to taste it..but of course this drink is looking so tempting as well.. Milk shake looks inviting and healthy too! Irresistible shake, would love to have it even daily. perfect for summer!!! very refreshing!!! Perfect as a summertime drink. Milkshake looks creamy and delicious. Lovely clicks. I totally agree about over ripe bananas. Rajani, only you can pull out such wonderful snaps with just a glass of shake. I can’t take my eyes off the pictures with your simplicity and bold statement. Love the cute mat ..The milkshake is just what I need now! That glass looks so so tempting…your clicking skills are awesome Rajani.